The list reveals the 25 eLearning Technology companies that are very effectively using Social Media for customer service/support and sales/marketing. The various factors that were considered while preparing the list were: frequency of activities on social media, likes, positive reviews, message response time etc. The company reveals that they did not seek applications or justifications from any company mentioned here. They did not seek any “Financial Sponsorship” or “Application Fee” from the organizations that appeared in the list. 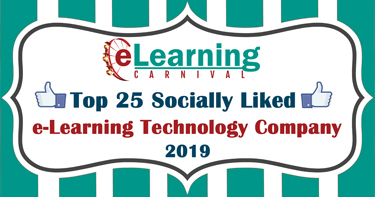 The 25 elearning technology companies that appeared on the list are: Mind Tools, Alison, Pearson, SuccessFactors, Dupont Learning,Conduent, EdCast, Cornerstone On Demand, SmartSchoolOnline, SkillSoft, Raytheon Professional Services, D2L, Grovo, Docebo, Talent LMS, Saba, Litmos, CrossKnowledge, elearning Brothers, Matrix, Degreed, G-Cube, GP Strategies, CGS Learning, Designing Digitally. Company: Learning Carnival Pvt. Ltd.